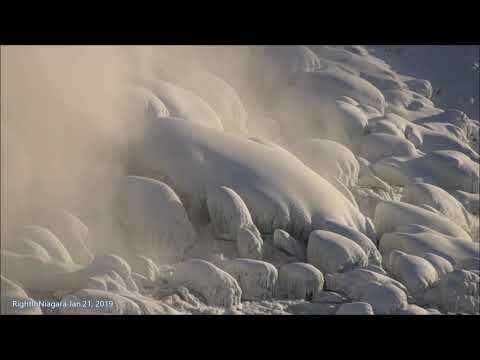 Scenes of the 'River of Ice' at Niagara Falls, Jan.21, 2019. While appearing calm from the distance, it is nothing but a fierce, brutal battle between water and ice down in the gorge. After several days of recent cold weather (today's daytime temp. was -12C), it is the ideal scenario for an Ice Bridge to form. (On Jan.17th the river was completely clear of ice) This is how the Niagara River usually looks just pre-Ice Bridge, as the ice shelves on either bank build up and out, slowly constricting the main center flow to the point where the surface ice stops moving. At that point, the river, still flowing under the stopped ice, continues to deposit more ice from underneath, causing the entire ice sheet to rise and solidify. As I was watching, the river ice had almost come to a stop and was barely moving (as seen at the beginning of the video). But the river's central current pushed through, and slowly, the massive accumulation of river ice got moving again. This process repeats itself over and over until the right circumstances line up for an Ice Bridge to form. This video encompasses over 2 hours of real-time river activity. Enjoy!